Microsoft CEO Satya Nadella bought all the members of his senior leadership team a copy of the book "Nonviolent Communication" in 2014 when he joined the company. "Words That Work in Business: 2nd Edition" Now $9.95! Use the code APRILSALE19 at checkout. Nonviolent Communication Companion Workbook, 2nd Edition for $7 Use the code CWB2 at checkout. 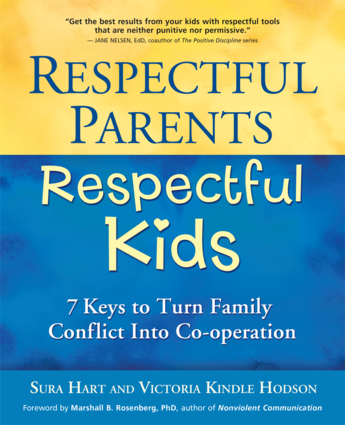 More than a tool to correct bad behavior, this handbook urges parents to move beyond typical discipline techniques by creating an environment based on mutual respect, emotional safety, and positive, open communication. The seven outlined principles redefine the parent-dominated family by teaching parents how to achieve mutual parent/child respect without being submissive, set firm limits without using demands or coercion, and empower children to open up, cooperate, and realize their own innate potential. Based on Marshall Rosenberg's Nonviolent Communication process, the framework helps parents break down the barriers to outstanding relationships with their kids by avoiding destructive language and habits that keep parents and children from understanding one another. Activities, stories, and resources help parents immediately apply the seven keys to any parenting situation. Sura Hart has provided training to peacemaking teachers in the Peace Army–Costa Rica; is the former education project director for the Center for Nonviolent Communication; and a former elementary, junior-high, and high-school teacher. She is the coauthor of The Compassionate Classroom. She lives in Santa Barbara, California. Victoria Kindle Hodson is a psychologist and the coauthor of The Compassionate Classroom and Discover Your Child's Learning Style. She lives in Ventura, California.